Often there are only a handful of differences between successful Internet Marketing strategies and campaigns that do not reach their goals. However, these small differences seem to be the key between overwhelming success and utter failure. Your business may have an unlimited budget for your marketing plan, but that should not motivate you to overlook the return on investment (ROI). Most modern marketers are quite surprisingly negligent when it comes to measuring the ROI for strategies being employed. Instead, marketers measure success in terms of likes and shares. However, these are not good metrics for understanding how much your company gets in return for the money you spend on a digital marketing tactic. Your marketing team must have a really good understanding of ROI. This is possibly the most important instrument for understanding without bias which tactics work best for your company. 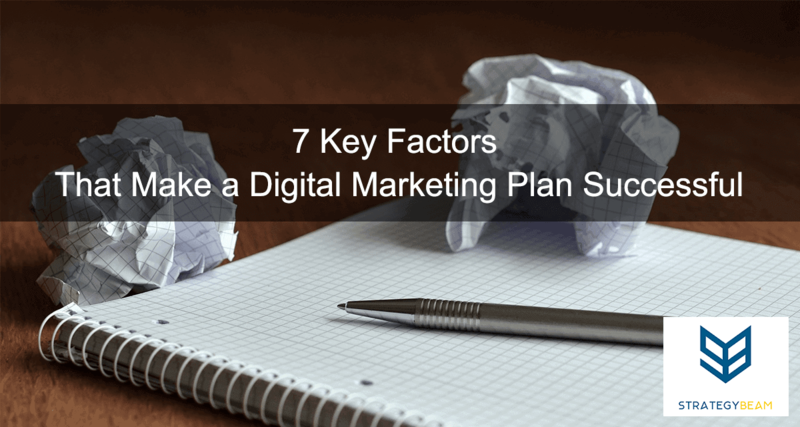 If your company’s digital marketing plan is without goals, it will function a lot like a speeding car without a driver; eventually, it will hit a wall and crash. As with everything else in business, your digital marketing plan should have a clear set of goals. For example, if the marketing team wants to attract 10,000 new Facebook profile page likes, then that’s a goal. Once you have set a marketing goal like this, it’s important to track it. Otherwise, it could take months or even years to reach a target. Keeping track of goals will also help the marketing team understand where the campaign is headed. When long-term goals are known, doing course correction in the middle of a campaign is also much easier. Businesses love to gather data like kids collect candy on Halloween. Everyone is in on the data gathering game, but only a few know what to do after the data has been gathered. A massive amount of data about the company’s target audience, brand awareness metrics, and so on, has little use without proper analysis. Hiring a consultant to conduct professional SEO marketing services can help you identify how your company can improve your online marketing strategy. Do not underestimate the power of video. Consumption of video content has spiked in recent years, particularly since mobile usage has gone up. Consumers love video, and this format can be used during every stage of the marketing and buying process. Video is also very flexible. Advertisers can easily create text articles and infographics based on a video to capitalize more from popular content. Video also translates well across various platforms including the web, social media, handheld devices and television. Such is the power of video that your company’s digital marketing campaign can benefit from. There’s one big mistake businesses make when it comes to customer outreach: framing outreach regarding social media shares and online comments. Despite what you may have heard, social media is not the best method to get your content to customers. Your articles and videos can easily get lost in the long newsfeeds that are always being updated with new content. So, the best way to get your content to customers is by e-mail. Your digital marketing strategy must have a strong e-mail outreach plan to reach the most loyal customers. E-mail is personal and is the best platform currently available to get the right type of content to the right customer. There are plenty of free online marketing tools that your small business can use to build a great email marketing program. More is not always better for digital marketing. The more focused your campaign is, the more likely it is to succeed. Therefore, do not exhaust your resources by marketing on every single available channel. Choose the channels that are right for your business. A professional SEO consultant can help you identify the best ways to grow your business while also evaluating your past performance and help you plan the future. Data analysis and keeping track of ROI will help your marketing team understand which channels provide the best results for the campaign. It may sound simple, but most marketers ignore feedback generated by surveys, online polls and customer comment forms. User-generated feedback contains a treasure trove of information about the aspects of business that work and the aspects that are driving customers away. Do not rely entirely on expert advice. The regular customers of your business are the ones who are in the best position to tell you what works and what does not. So, do pay attention to feedback. Incorporate the lessons you learn from feedback into your digital marketing strategy. The digital marketing landscape is always changing. Therefore, it’s perfectly normal for businesses to feel confused about which tactics to employ in order to create brand awareness and boost sales. But businesses should not stay confused for long. The companies that master the complex language of digital marketing will be the ones that stay ahead in the game.